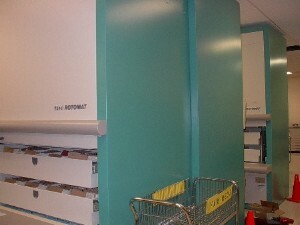 Electric File Cabinets, called a Rotomat from Hanel Storage retrieves your files with the touch of a button in seconds. The days when walls were lined with filing cabinets and when index cards archives gathered dust are over. The legwork and ladder-climbing used in searching for files is now over. 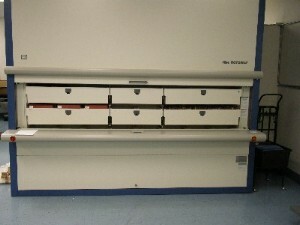 Rows of filing cabinets can be replaced with a single Rotomat configured with full suspension roll-out file drawers. The days when walls were lined with filing cabinets and when archives gathered dust in the cellar are over. The legwork and ladderclimbing involved in searching for files are a thing of the past  they cost too much time and money! The compact design of the Rotomat® allows up to 60% more storage capacity to be accommodated on minimal floor space by making use of the available room height. 208 or 480 V three-phase motors (other voltages and Hertz values, as well as AC connection are possible). Pole-switching three-phase motors are used as standard, enabling gentle but powerful acceleration and braking even under different load conditions. Hänel ensures maximum safety by using patented safety threshold switches and light-barrier curtains compliant with DIN EN 15095. Optimum utilization of floor space. The term upward mobility takes on a new meaning with the Rotomat®. The Rotomat® is as flexible as you need it to be. Units can extend through several floors. High-performance controls and computer interfacing ensure that the Rotomat® can be put to use flexibly and on an individual basis. 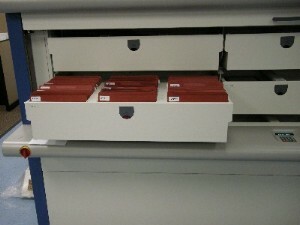 The required files are brought to the ergonomically positioned retrieval point. Safety has top priority. No ladder-climbing, no stretching, no bending. 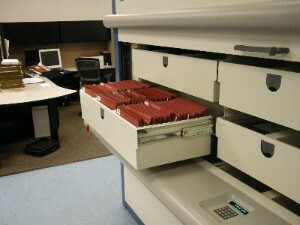 The Rotomat® protects all the files from dust, light and unauthorized access. Classic design, five attractive colors to choose from. Individual finishes are possible.